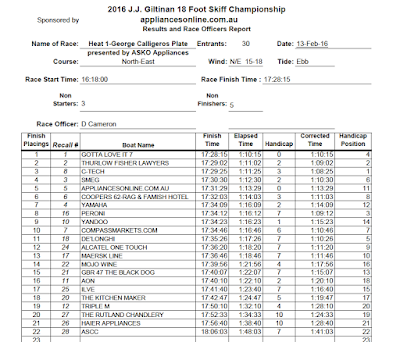 A 20-knot North East wind and run out tide produced brilliant conditions for some wild spinnaker rides in the opening race of the 2016 JJ Giltinan 18ft Skiff Championship on Sydney Harbour today. 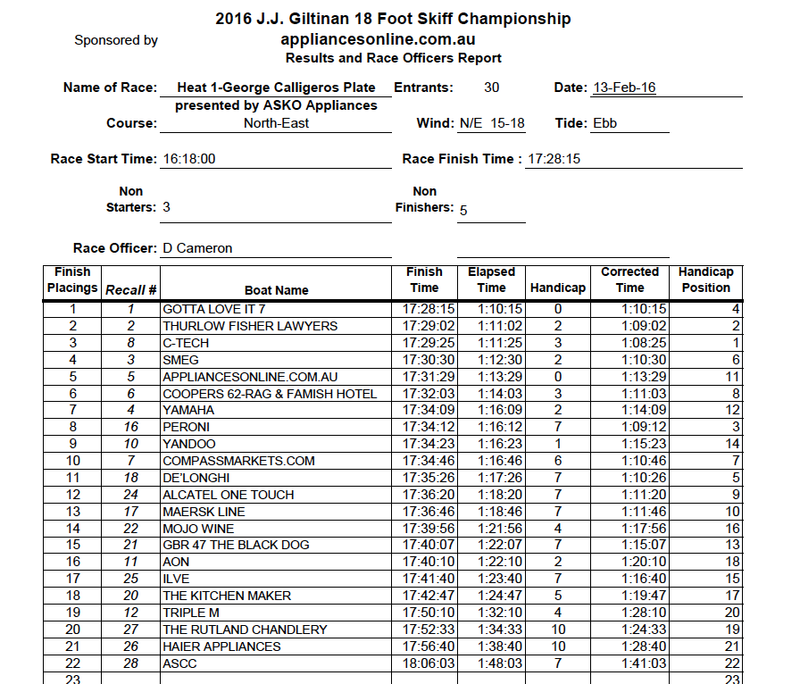 In one of the most incident packed starts to a JJs championship regatta, defending champion Gotta Love It 7 (Seve Jarvin, John Winning Jr., Nick Catley) made an outstanding return to their best form to take victory by 47 seconds from NSW champion Thurlow Fisher Lawyers. The incidents began even before the starter sent the fleet away. 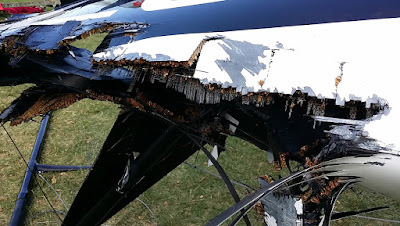 Most critical incident involved the Lumix skiff (Daniel Phillips), which was badly damaged and certainly no possible hope of competing in the regatta. Thurlow Fisher Lawyers, Yamaha (David McDiarmid), Triple M (John Sweeny) and C-Tech, along with Gotta Love It 7 were among the leading group on the windward leg to the Beashel Buoy. Gotta Love It 7 held a narrow lead over Thurlow Fisher Lawyers, Yamaha and C-Tech, with a closely bunched fleet hot on their tails. Gotta Love It 7 maintained her advantage to the bottom mark off Clarke Island. Thurlow Fisher Lawyers was still in second place but appliancesonline had made a great recovery, after her recalled start, to be in third spot, just ahead of Smeg and C-Tech. Appliancesonline was unable to maintain the charge and dropped back behind C-Tech and Smeg over the final lap of the course. 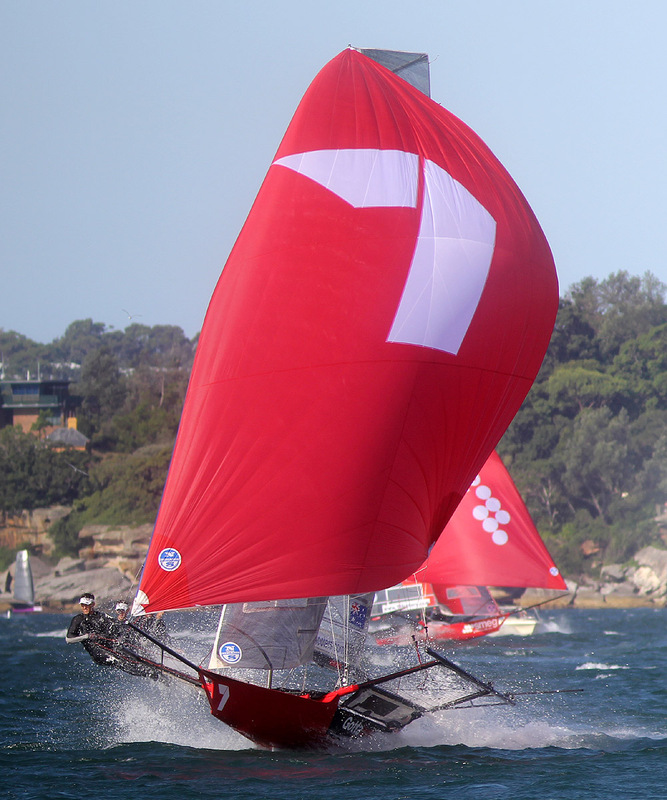 Coopers 62-Rag & Famish Hotel and Yandoo (John Winning) were among early casualties and both came from a long way back in the fleet to finish sixth and ninth respectively.